Italian flavours meet Japan's favourite fast food at Due Italian, a supremely individualist ramen shop run by fusion experimenter extraordinaire Kazuo Ishizuka. 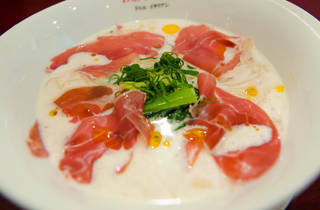 The leek- and cheese-topped ramen fromage and limited-edition 'foie gras daikon-men' are some of the more curious menu choices, but Due is still best known for its white ramen, the mind-boggling but actually rather tasty creation that combines Parma ham, mozzarella, basil and a whole bunch of familiar thin noodles. 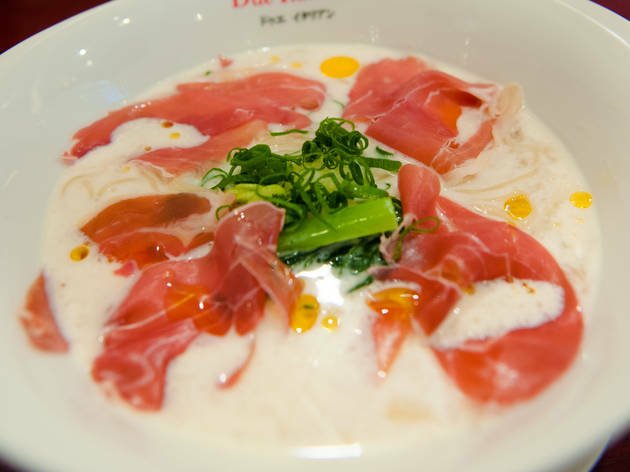 If you've had enough of the tonkotsu, this is certainly a bowl to try.